In 1854, the Kansas Territory was organized, then in 1861 Kansas became the 34th U.S. state. In 1855, Woodson County was established. Fort Belmont was used during the Civil War and had received refugees from the Trail of Blood on Ice. Opothleyahola is buried in an unmarked grave next to his daughter who died at the fort. According to the U.S. Census Bureau, the county has a total area of 505 square miles (1,310 km2), of which 498 square miles (1,290 km2) is land and 7.4 square miles (19 km2) (1.5%) is water. 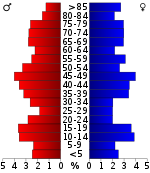 In the county, the population was spread out with 21.70% under the age of 18, 7.40% from 18 to 24, 22.10% from 25 to 44, 23.90% from 45 to 64, and 24.80% who were 65 years of age or older. The median age was 44 years. For every 100 females there were 96.80 males. For every 100 females age 18 and over, there were 96.80 males. Woodson County is powerfully Republican. The only Democrat to win a majority in the county was Franklin D. Roosevelt in 1932, although Woodrow Wilson won a plurality in 1912. In contrast, Charles Evans Hughes in 1916 & George H.W. Bush in 1992 are the only Republican winners of the county who only managed to win a plurality of its votes. Woodson County is divided into six townships. 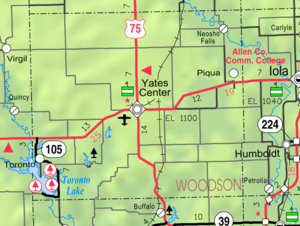 The city of Yates Center is considered governmentally independent and is excluded from the census figures for the townships. In the following table, the population center is the largest city (or cities) included in that township’s population total, if it is of a significant size. ^ a b “State & County QuickFacts”. United States Census Bureau. Retrieved July 29, 2014. ^ “U.S. Decennial Census”. United States Census Bureau. Retrieved July 29, 2014. ^ “Historical Census Browser”. University of Virginia Library. Retrieved July 29, 2014. ^ “Population of Counties by Decennial Census: 1900 to 1990”. United States Census Bureau. Retrieved July 29, 2014. ^ “Census 2000 PHC-T-4. Ranking Tables for Counties: 1990 and 2000” (PDF). United States Census Bureau. Retrieved July 29, 2014. ^ a b “WOODSON COUNTY, KANSAS COUNTY HISTORY”. genealogytrails.com. Retrieved 18 September 2017. Standard Atlas of Woodson County, Kansas; Geo. A. Ogle & Co; 38 pages; 1904.